A desirable lifestyle town with community spirit. Born, bred, educated and now with a well-established career in the Winton area, Kelvin Moylan is a confirmed Southlander. He markets residential and lifestyle property for PGG Wrightson Real Estate. For Kelvin, it’s all about place, and he is understandably proud of his town. “Thinking about Winton, the word ‘community’ comes to mind. We are a small rural town. We talk to each other, we say ‘hello.’ When you first arrive, you quickly and easily come to know many people in the community. “Because we are right in the middle of Southland, we are surrounded by agriculture, which is the driving force of our region’s economy. People who live here can easily be self-contained, shopping in Winton, doing their banking, legal and farming business, going to the bakery or the supermarket or whatever, right here. It is not critical to go into Invercargill; though it is an easy enough trip, you can be happy just being here,” he says. “This region is proud to boast a Prime Minister in Bill English, who grew up in the area and went to primary school in Winton, and also a Deputy Prime Minister in Sir Brian Talboys, who farmed in Southland after World War Two and served as the local MP from 1957 to 1981. “One of our big drawcards is the indoor stadium, with tennis and netball courts, and the town also recently built a skate park. Opened in 2014, the Winton Rotary Trail is another fantastic community asset: a nine-kilometre path, suitable for walkers or cyclists encircling the whole township and including native bush, the Winton Stream and rural farmland,” says Kelvin, who has been involved in real estate since 1994. For the first three years, he was personal assistant for his mother, Julie, who marketed local property and coined the phrase ‘Winton, a great place to live,’ which Kelvin still uses today. For the last five years, he has operated in the local property market under the PGG Wrightson Real Estate brand. Daina Robinson’s enthusiasm for Winton is almost as strong as Kelvin’s, though has a different basis. She and her family moved from Northland, the other end of the country, in 2014. 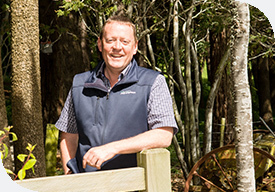 “My parents wanted to retire here, as they have connections in Southland. I decided to come here too, as it offers a better lifestyle and education for my children, and the housing prices are so much more achievable. You can buy a really decent house in Winton, and not mortgage yourself to the hilt. And for anyone heading into retirement, you can buy a great house and still have money in the bank, meaning you don’t have to compromise on enjoying a good lifestyle. “Since we are inland, Winton has absolutely gorgeous frosty winters and beautiful hot, dry summers,” she says. Daina’s daughters, 11-year-old Lily and eight-year-old Ruby, go to the local Winton Primary School, her parents are settled, and Daina bought a local hair salon on the main street. “I have been hairdressing for 25 years. Coming into the business community in a small town has been positive. Everyone has been supportive and the business is flourishing. “My parents bought a beautiful place and I bought a four-bedroom house without a huge mortgage. Mum and Dad do volunteering work at the local school, and we were all able to easily join clubs and become involved in the community. “It’s a very outdoors type of region. My girls are into touch and cycling, plus arts and crafts. They can leave their bikes on the side of the road, safe knowing nobody is going to take them. Living here, we have a better lifestyle and freedom. It’s like it was 20 years ago. All the neighbours know each other, and Lily and Ruby are allowed the freedom to have a proper childhood,” says Daina. Kelvin’s own community service includes chairing the Board of Trustees of the town’s St Thomas Aquinas School, the four-class year zero to eight school where Bill English began his education. “After he became Prime Minister in 2016, his first official visit to Southland was to his old school. We were really proud to host him,” he says. A four-bedroom low-maintenance brick home on a private, well-established, well-fenced 1296 square metre Winton section sold last spring for $515,000. Last summer, a new four-bedroom brick residence with indoor/outdoor flow and a spa pool, on a 2 hectare hill property, with great views of Central Southland, and near Winton township sold for $529,000. In January, a modernised three-bedroom brick and roughcast home, set on a 5.5 hectare deer-fenced block to the west of Winton sold for $215,000. An as-new four-bedroom residence in one of Winton’s most desirable subdivisions sold in February for $730,000. In March, a modern-style four-bedroom residence, to the south of Winton on 2.4 hectares, sold for $540,000. A modernised four-bedroom residence, with a large living area, en suite and a double garage, centrally located in Winton on an established 1004 square metre section, sold in March for $384,000. “When you live in Winton, you have an amazing amount of things you can do. It is impossible to be bored here. I have clients in the salon who are 90 years old who have a better social life than I do,” says Daina.